Introducing Playwoolies- the original, genuine woolie-style leggings made from 100% ExtraFine Merino Wool Easy Care. NOTE: All sales on clearance items are FINAL. No returns are accepted for any reason. Sustainablebabyish Playwoolies - The Sloomb Basewoolies You Love, But Easier! Life is busy, and sometimes little ones are too busy at play to be worried about changing. Say hello to Sustainablebabyish Playwoolies, a comfy wool legging designed especially for infants and toddlers! 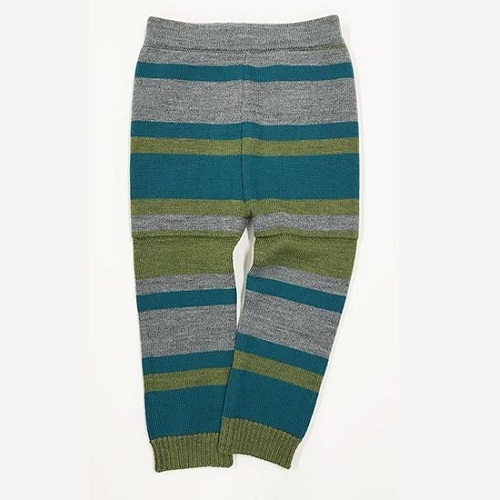 Playwoolies can be worn under regular clothing to keep warm in chilly weather, or worn alone as cozy leggings that are perfect for lounging and play. Playwoolies can be used as a cloth diaper cover when lanolized and feature a double layer in the "High Volume Wet Zone". The team at Sustainablebabyish|Sloomb designed these woolies with your lifestyle in mind. Playwoolies are made with 100% ExtraFine Merino Wool Easy Care, a special wool fiber designed for easy maintenance. Take all you've heard about wool diaper cover care and toss it--these squishy soft wool leggings are machine washable!!! That's right, your Playwoolies can be washed in your washing machine on a delicate setting. Sustainablebabyish playwoolies are made with 100% Extrafine Merino Wool Easy Care with an elasticized waistband. Care Instructions: Hand or machine wash warm, inside out with like colors. Use a delicates or wool wash. For best results, hand wash. Lanolize if using Playwoolies as a cloth diaper cover, lay flat to dry. Do not iron, do not dry clean. Do not use bleach or whiteners. Sloomb products are responsibly machine knit in China with öko-tex certified wool yarns. A year round, day or night cloth diapering essential! This seem to be on the bigger side so they don't fit my daughter yet. But they are SO soft and cute. I can't wait until they fit her. I wish they made these in adult sizes! The wool is so soft. They'll fit for awhile, as I just cuff the legs. I had a little trouble with the price at first, but got them on sale, and they're totally worth it. I love all our playwoolies! They are so cute, versitile, and soft! My toddler likes them a lot too and enjoys wearing them. They make for a cute outfit and are also great for bedtime. My daughter is a heavy wetter and we use overstuffed fitteds at night with a PUL cover and playwoolies over top. She will pee straight through the PUL cover, but her woolies give her enough protection that the sheets stay dry! I definitely recommend. These are our first playwoolies and even our first SBish woolies and they are amazing!!! They are so soft and thick and the quality is amazing so glade I went ahead and got them even though they are a size to big she can actually still wear them as long as I roll up the pant legs. I didn't Machine wash them only because I was already washing some of my there woolies and didn't see the point in wash one by hand and one in the washer. I will definitely be buying more in the future.